Sun Hats & Wellie Boots: How to grow beans in bottles! 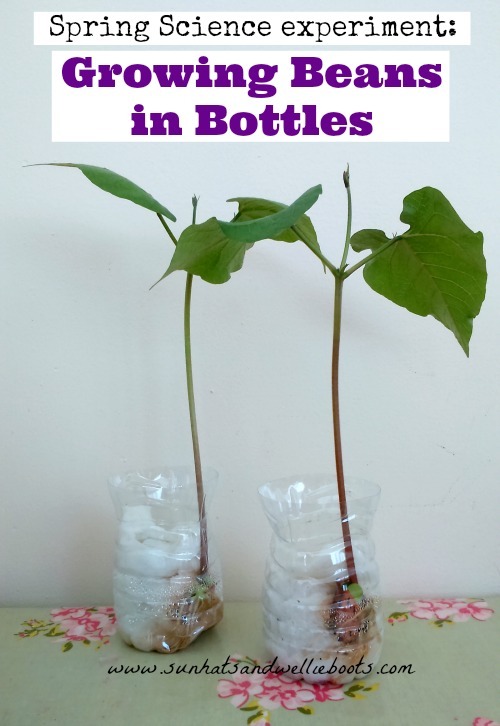 How to grow beans in bottles! 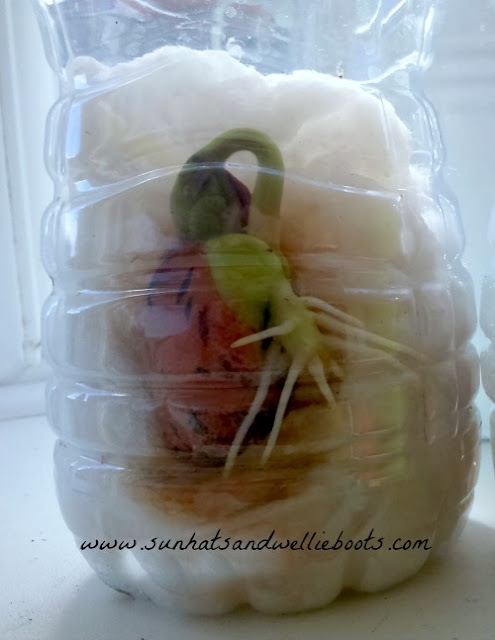 This is such a neat & simple science experiment for children to study how plants grow. It gives fairly quick results too, perfect for younger children who are eager to see results. Spring is bursting out all around with its beautiful blossoms, buds & green leaves appearing on surrounding trees. The seedlings which we planted a few weeks ago are now ready to be planted into bigger pots, with some ready for our veggie patch. We've been amazed just how quickly the seedlings have appeared, & have eagerly watched the shoots pop through the soil. Observing just what happens to the seeds under the soil of course provides children with a real insight into how plants develop, & this is what we set out to discover with our bottle experiment. 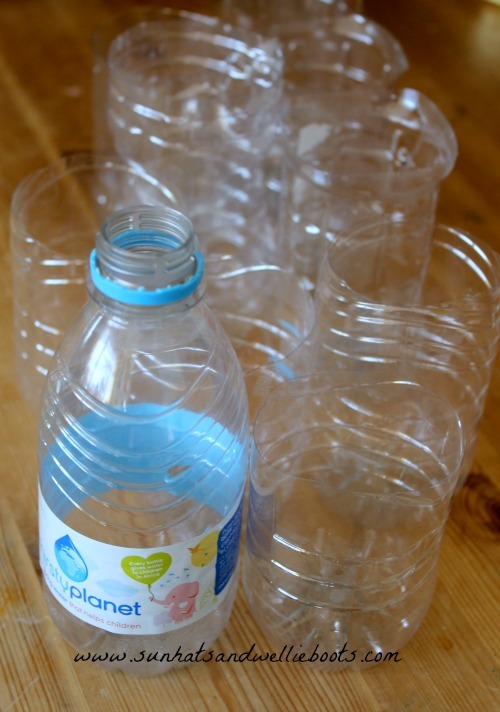 For our experiment we recycled several small water bottles & carefully cut the top section of the bottle off, along with the label. We filled half the bottle with cotton wool, & then added our bean which we carefully placed down one side of the bottle so we could clearly see it. We used runner beans for this experiment, but have previously used broad beans which work just as well. Then we added a little water, just enough to soak the cotton wool, & placed the bottle on a sunny windowsill. The plastic bottle planters were an ideal size for our narrow windowsills, & if they were to get knocked over we knew they wouldn't smash. 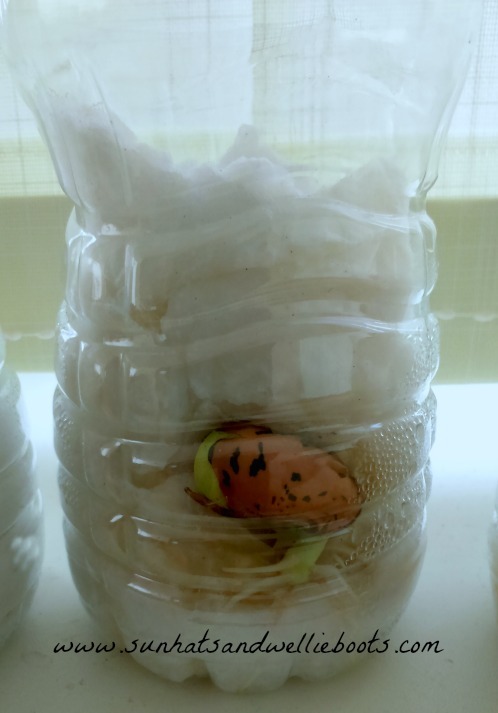 After just 3 days we noticed the bean had started sprouting roots & the bean stem was starting to appear at the top. Within 5-7 days the beans were shooting & the roots growing longer & thicker. And by 10 days we had tall beans which were ready to plant outdoors. 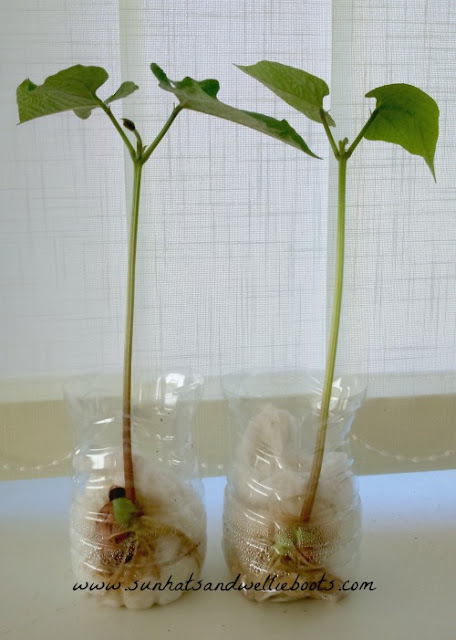 This simple experiment could be developed further by keeping a record of the beans growth day by day, & the sprouting bean stalk could be easily measured & it's growth marked with a Sharpie pen on the bottle. Or you could invite children to draw their findings as the seed bean develops. 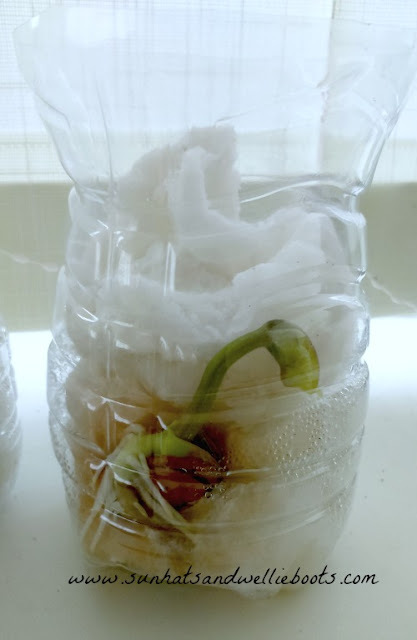 This bottle experiment is also a neat way to explore life cycles. Once you've planted the bean plant from your experiment into the garden you could encourage the children to keep an eye out for the new beans the plant will produce. Towards the end of the growing season keep some beans back to dry, these can then be planted out next year. The plastic bottles can also be reused as seedling planters, so nothing is wasted.